FriendGrief: "Lots of Candles, Plenty of Cake"
I was fortunate to be in the audience for the Chicago Tribune’s sold out Printers Row Live event on Friday evening, a conversation with author Anna Quindlen. 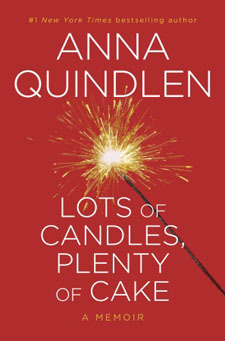 Her new book, Lots of Candles, Plenty of Cake, is a thoroughly enjoyable reflection as she reaches a milestone birthday this summer: sixty. In the interest of full disclosure, I’ve been a fan of Quindlen’s for many years, and not just because we share a birthday. Her writings have spoken to a generation of women whose lives were defined by choices our mothers never enjoyed: choices that complicated as well as simplified our lives. In her latest book, Quindlen takes time to pause, to look at where she’s come from and where she’s going. Her conversational tone – reminiscent of those times with friends when we dissect our lives and solve the problems of the world – makes this a quick, but thoughtful read. She addresses many of her trademark topics: women in the workplace, parenting, growing up Catholic, marriage. But, cognizant of moving from what one author called ‘moving from middle age to Renaissance’, she considers her future, and what aging means to a generation of women who are living decades longer than their parents. The parts of her book that resonated the most with me right now were those that addressed aging and friendships. You know how it is: friends from the old neighborhood, from high school, from college or your first job. They remember things…they remember you, and who you were at a particular time in your life. The longer the friendship, the more “you’s” they remember. Deep into her book, Quindlen quotes memoirist Carolyn Heilbrun. I thought that was a great way to describe a lot of us Baby Boomers. We have believed most of our lives that we are the first generation to experience…almost everything. Now unable to deny that we are no longer young, we are forced – kicking and screaming, it seems – to admit we are getting older. In spite of our best efforts, we are not immortal. There’s no doubt that we Boomers are unwilling to accept a traditional, sedentary old age. We are determined, as always, to reinvent every stage of our lives. We can’t put off the inevitable, at least not forever. But we can enrich our lives now – no matter how old we are – by treasuring and nurturing and enjoying our friendships. If you’re a woman of a certain age – or even if you just want to understand women of a certain age – you’ll enjoy Lots of Candles, Plenty of Cake. And be sure to share your cake with friends. Check out Anna Quindlen to order this or any of her other books, and learn more about upcoming appearance.